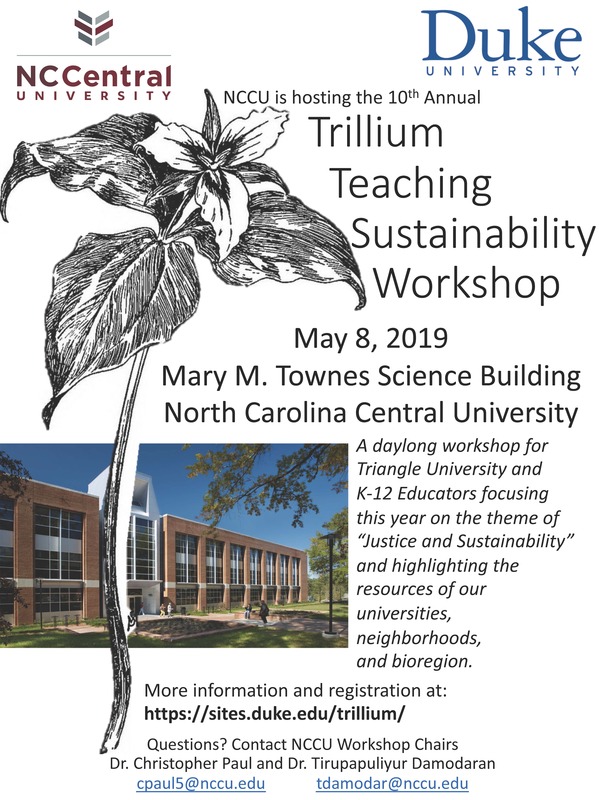 We are pleased to announce that the 2019 Trillium Sustainability Workshop will be held in partnership with NC Central University! Mark your calendars for Wednesday, May 8, 2019 from 8:30 AM to 5 PM at NC Central’s Mary M. Townes Science Building. The workshop is offered free of charge, and breakfast, lunch, and snacks will be included. An optional social will be held in the evening from 5-6 PM. Trillium’s definition of sustainability includes the three key dimensions of social equity, economy, and environment. Thus, in promoting economic and environmental sustainability, we cannot neglect social equity in the populations we serve, the level of access, or the burden of costs. It is with this attention that the 2019 theme will explore the extent of justice in reaching our sustainability goals. Are the materials we teach accessible and sustainable in all forms? Are there ways to have a broader reach or make more lasting impacts? The Trillium Workshop is an opportunity to learn how to integrate sustainability and justice concepts into teaching and curricula across diverse fields. You would join an interdisciplinary and inter-institutional network of Fellows teaching about sustainability. We encourage you to share the application with faculty, staff, graduate students or K-12 teachers with current or future teaching responsibilities who might be interested in participating. The application is open until April 22, 2019, and admissions will be rolling. The Trillium Workshop is being hosted by North Carolina Central University and Duke University as a part of a regional partnership among Triangle institutions. Drs. Tirupapuliyur Damoradan and Chris Paul are NCCU co-organizers. For more information, please email trilliuminfo@duke.edu.